O'Donnellan & Joyce is offering for sale a superior four/five bed detached family residence presented in showhouse condition at Hazelwood, Taylor's Hill, Galway. 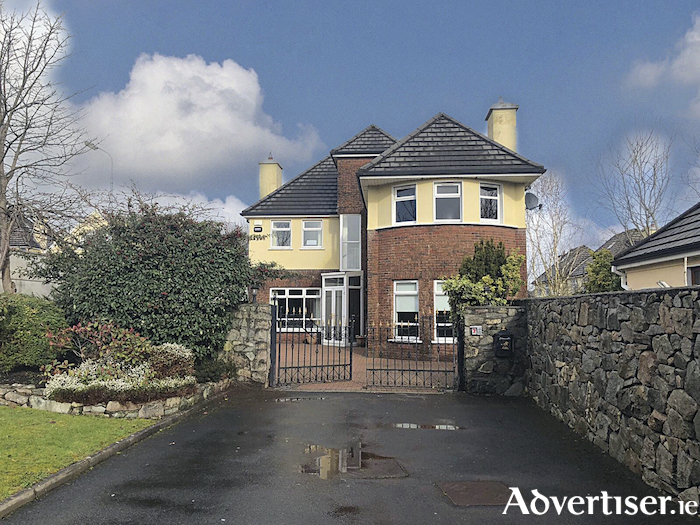 This is a large detached home measuring circa 1,998sq ft. Hazelwood is a highly sought after and much acclaimed residential development, located just off Taylor's Hill, regarded as one of Galway's premier residential areas. No 7 is tucked away in this meticulously maintained development in a quiet cul-de-sac. Standing on a substantial corner site, with a sunny southerly aspect to the rear, the upper floors offer views of Galway Bay and the Clare hills. The property has all that one could ask for in terms of convenience, class, and style. The current owners have spared no expense in creating a wonderful home with careful attention to detail and decor throughout. The property is presented in excellent condition throughout, with spacious accommodation and many wonderful features such as two large reception rooms, an open plan kitchen/breakfast room, a separate conservatory/dining room, an electric home sauna, four/five double bedrooms, two en suite bathrooms, built-in wardrobes in all bedrooms, and wonderful privacy both front and back. The property is perfectly positioned, just a stone's throw from Salthill Promenade with its lovely beaches. Also within walking distance is the local GAA grounds at Pearse Stadium and a number of notable national and secondary schools such as Taylor's Hill, Salerno, and St Enda's, while still situated in a quiet residential location. This highly desirable location is also just a short walk from the city centre, Galway's West End and the Latin Quarter with its many shops, bars, and restaurants and some of Galway city's famous landmarks such as the Spanish Arch, the Long Walk, and Galway Cathedral. The property is also serviced by excellent transport links bringing an abundance of local amenities to its doorstep such as NUIG and UHG and a host of shops, services, and sporting facilities. No 7 Hazelwood is a wonderful property, with accommodation including an entrance porch, and an entrance hallway with feature solid wood spindle staircase. To the left of the hallway is the front sitting room with three feature bay windows and a marble fireplace. A second lounge room to the left of the hallway contains a feature marble fireplace with single door access into the kitchen/dining room and dual aspect windows to the front and gable end. The heart of the home the kitchen/dining room is beautifully appointed with a modern fitted kitchen with granite worktops, a feature glass splashback, integrated double oven and microwave. The kitchen also has a feature island with space for seating and a built-in hob with stainless steel extractor fan. The kitchen/dining room has a large floor to ceiling window and a sliding patio door to the private rear patio and garden. A downstairs guest wc and separate utility room completes the accommodation on the ground floor. On the first floor the landing is open gallery style with lots of light flooding in, and there are four large double bedrooms. The large master bedroom offers an array of fitted wardrobes as well as a beautiful en suite with tasteful tiling. Continuing on to the second floor via a full stairs, the property also has the benefit of an attic conversion with timber flooring, built-in shelving, and Velux window; this would be an ideal fifth bedroom, office, or playroom subject to the relevant planning. Outside the property overlooks a large green area to the front. A walled cobblelock driveway and lawn are to the front and side, offering ample off street parking. The private walled rear garden has a wonderful sunny southerly aspect and offers complete privacy with a patio, mature planting, and a lawn. The garden also contains a separate block built shed and boiler house. Its idyllic location offers a huge range of amenities all within easy reach or indeed walking distance. This property is without doubt one of the finest to have come to the market in recent times. This is an outstanding family home in an outstanding location and viewing is highly recommended. The BER is D1. Asking price is €870,000.